New clients Mike and his son Mike Jr. were onboard with me at Don Pedro on August the 27th. 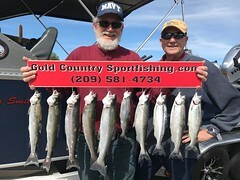 The morning started off fast with just after setting the four rods we had a fish on that was a nice kokanee and then a few more and then things went quite as then we had to work for our fish as we were fighting a full moon so I knew the bite would at some point come back and it did. We had many hook ups on kokanee that would knock the line off the release, but would come off half way to the boat. 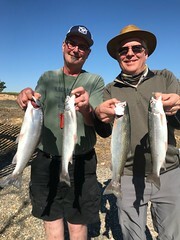 They did end the day with five kokanee and nine rainbows from the waters of Don Pedro and the last fish of the day was a three and a half pound rainbow. Thanks again guys for coming out!!!!! 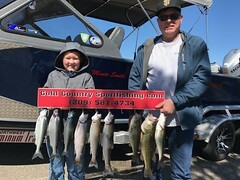 This entry was posted in California, Don Pedro fishing guides, Don Pedro Lake, Gold Country Sport Fishing, Kokanee, Melones. Bookmark the permalink.